The Building Change Trust has been exploring the concept and practice of open government over the past year. Our interest emanates from our ‘Creative Space for Civic Thinking’ work which is about supporting the Voluntary, Community and Social Enterprise sector in its role as an interlocutor, enabling citizens to influence statutory decisions that impact on their lives. We have been looking specifically at the international Open Government Partnership (OGP) and whether it holds potential as a vehicle for dialogue between the Northern Ireland Executive and civil society about improving transparency, public participation and accountability across government. 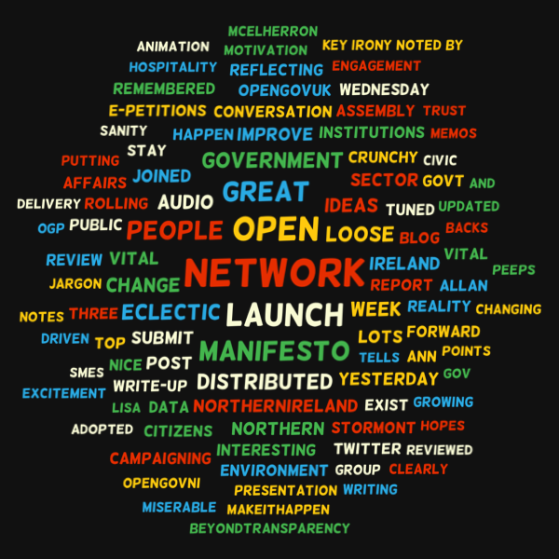 We held a seminar on the potential implementation of the OGP in May of this year and, following a high level of interest from citizens and representatives of the third sector, we launched an Open Government Network in Northern Ireland in early November. So what can this network possibly hope to achieve given the current political context? There’s plenty of fodder out there for those cynical about the stability and performance of Northern Ireland’s devolved institutions. The latest round of inter-party talks has been beset by a series of high profile disputes and many in the media and also in the third sector have questioned the commitment of those around the table to break the logjam. An ongoing barrage of allegations has also suggested that our government is quite the opposite to ‘open’. Most recently we have heard of failures to respond to Freedom of Information requests, an unwillingness on the part of political parties to say who funds them and swingeing cuts to public services without any serious engagement with the people affected and alleged improper use of MLAs' expenses. In such circumstances it would be easy to conclude that asking for a more open government in Northern Ireland is nothing more than wishful thinking. Perhaps, however, it is the very fact of the crisis that creates the space for more openness to emerge. After all is said and done all of the parties around the Executive table, as well as several that are not, are committed to the devolution project. They know they have to find a way to make the institutions work for the people of Northern Ireland. They also know that public faith in these same institutions is at an all-time low, with the latest Belfast Telegraph opinion poll delivering a massive vote of no confidence for our politicians. The honeymoon period, during which the public were just relieved that the institutions even exist, is well and truly over. The current budgetary crisis and next year’s looming austerity threatens to exacerbate this situation further and undermine our fragile stability. Something has to change, and soon. The case for a more open government is not difficult to make. It could help to restore public faith in the integrity of the institutions through greater transparency, public participation and accountability. It also creates a situation where the onus is no longer purely on the politicians to resolve intractable problems, but rather this becomes a shared endeavour across society. Citizens would have a greater say about government’s priorities to enable a greater match between public services and public needs. Early evidence from the more than 60 countries participating in the Open Government Partnership suggests that real progress has been made. A browse through the case studies on www.opengovpartnership.org includes achievements as diverse as more meaningful and inclusive public consultations on legislation in Croatia, increasing corporate accountability in Brazil, requiring government agencies to publish all decisions online in Greece and unleashing the transformative power of open data in Moldova. A key question that is often asked is whether the commitments that have been made would have happened anyway, and whether initiatives like OGP don’t just amount to a government PR coup. Those involved in the Irish and UK OGP processes to date are philosophical about this. While achievements have been modest and far from all that civil society would have wished, it is important to remember that this is a long game. In the first cycle of action plans one of the key outcomes has been the establishment of the principle of partnership between government and civil society. Some significant new commitments have emerged that featured highly on civil society’s wish list, such as the abolition of fees for Freedom of Information requests in the Republic of Ireland and the establishment of the UK’s first registry of company beneficial ownership – information about who owns and ultimately controls companies. Closer to home, the door isn’t as closed as some might think. Simon Hamilton MLA, Minister for Finance and Personnel, addressed the launch of the Open Government Network and outlined some of his plans for public sector reform in Northern Ireland. He indicated a particular interest in three areas of open government. In the area of open policy-making, a public sector innovation lab has been launched for the purposes of bringing different perspectives into policy processes to devise innovative solutions to societal challenges. On open budgeting, the Minister indicated his preference for a pre-consultation phase for the Executive’s budget which would allow citizens to influence priorities before the big decisions have been taken. Finally in the area of open data, he spoke of making government-held data available to the public for re-use in developing fresh analysis of particular problems and influencing improvements in public services. The Minister has also asked the Organisation for Economic Cooperation and Development to conduct its first sub-national public governance review. This will include benchmarking Northern Ireland against international standards in relation to public engagement in policy-making. Won’t this network just be the usual suspects? The Building Change Trust has simply created the opportunity for this network to emerge. Now it’s down to interested individuals and VCSE organisations to get involved. Quite a few have already. A more open government certainly won’t happen if we don’t push for it.